“The Song of Songs stands as unique among the books of the Bible. 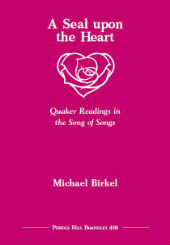 This collection of love lyrics, candid in their sensuality and profoundly poetic in their imagery, has attracted lovers of God across the centuries.” Michael Birkel celebrates the poetry of love and the allegory of spiritual intimacy found in this anomalous book. He explores early Friends’ use of its imagery to express their longing for union with the Divine Spirit, their joy in communal worship, and a tenderness to all people in language that remains vivid and moving today. Discussion questions included.